Rob Bertholf was the first to send a tweet from Hawaii and has been known for being a pioneer by effectively combining his background as web developer, graphic designer and SEO expert, to stay on the cutting edge and remain #1 under “search engine optimization expert” on Google. Rob was introduced to Social Media Club Honolulu in February 2009, when he was first invited to speak about SEO to the local chapter, as the instructor for University of Hawaii’s Pacific New Media program. “After meeting Roxanne Darling, whose high energy was infectious, I became an active member.” Fast forward to the present and Rob is among our most active small business members. 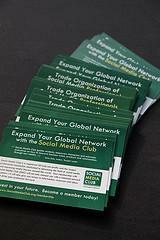 With the growth of our chapters across the globe, there has been an obvious need for marketing collateral to help further the message and missions of Social Media Club. Since Rob is actively involved in the Honolulu chapter, he knows how heavily Social Media Club relies on volunteer support and graciously stepped up to offer his services to help develop marketing flyers. Rob mentioned that he appreciates the fact Social Media Club Honolulu allows for challenging discussions with his peers. His participation in the chapter has attracted many other professionals to join, including the newest SMC Honolulu President, Tara Coomans. Recently, Rob created a new site called Hawaii Klout, which aggregates Twitter users located in Hawaii and provides their influencer scores, which has now spurred a partnership with Klout. Again, our deepest thanks to Rob Bertholf for helping Social Media Club make larger strides to support our chapter leaders with promotional material which will help grow their communities.